This week, I have a special guest column from Eric Streller of FantasyLoot.com, who will discuss who to select and who to avoid in your daily fantasy lineups. When you play fantasy football on FanDuel each week, millions of dollars are up for grabs. It’s changing the way that we play fantasy sports. With that said, one week fantasy football is much different than your standard league. It’s very mathematical and requires an analytic approach. You must be able to determine value of a player to decide whether they are worth a play for the given week or not. Setting a salary cap lineup by just picking your favorite players or “whoever you think will score the most this week” is not a winning recipe in the long run, however. Of course, you have to pick a mix of studs and sleepers to stay under the salary cap, but no matter what, you must always make sure a player is worth what you’re paying that week. There’s no supply and demand in salary cap fantasy sports, and each player is assigned a value that you’re either going to willingly pay for or pass on. It will never fluctuate for a given week. So, it is your job to determine whether or not a player is worth the dollar value that is being asked for him. It’s important to realize this, because every dollar you spend on one guy, is one less dollar available to spend on the next guy. You have to make sure you’re getting maximum value out of each player. Each week, in this “To Buy or Not to Buy” column, I’m only going to discuss higher-costing players, typically $8,000 or more. Sleepers are always an important topic, but a winning lineup must also have a mix of studs who produce equal to or greater than their value to give you the best chance of finishing in the money. Here is Week 3’s players to buy and not to buy. Drew Brees: $9,100 – I think Brees has a great chance to be the highest-scoring fantasy quarterback this week. The Saints are better than 0-2, and I think the team will show it here. It wouldn’t surprise me to see 300 or more yards and 4 touchdowns from Brees this weekend. DeMarco Murray: $8,700 – It scares me to bet on the Cowboys’ game plan, but the brass said all offseason that the offense was going to run the ball a lot this year. Murray rushed a career high 29 times last week, and the Cowboys should continue feeding him the ball against a Rams’ defense that hasn’t done anything respectable against the run yet. In my opinion, he’s a top 3 fantasy running back so far, but in Week 3, he’s outside the top 5 from a value perspective. Brandon Marshall: $8,200 – Marshall is still Jay Cutler‘s favorite target, and it showed in last week’s press conference after his three scores. I don’t expect three more this week, but he’s in line for 100 or more yards, and a touchdown almost every week. 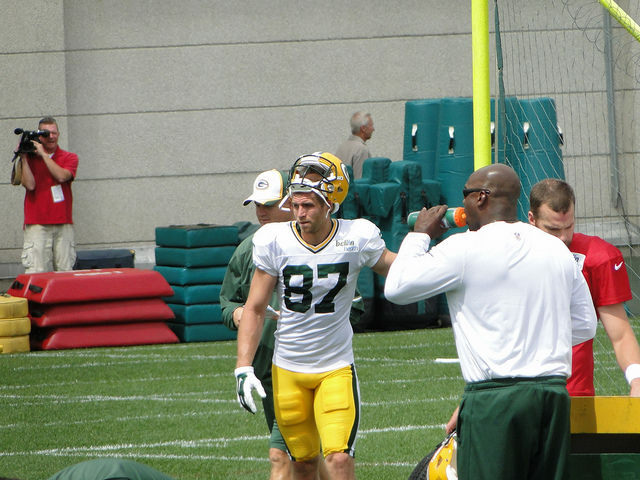 Jordy Nelson: $8,600 – Nelson had a monster game last week and was targeted 16 times. He’ll get open against the Lions, and he’ll get the ball. While I don’t expect Rodgers to have a huge game, Nelson should still produce. Jimmy Graham: $8,400 – Brees spreads the ball around a lot, but it’s Graham he looks for the most, especially around the end zone. I predicted Brees to throw four touchdown passes, and I expect Graham to catch one or two of them. A lot of times in one-week fantasy leagues, I like to go with the quarterback/wide receiver combo that has the best chance of hooking up for multiple touchdowns, and you can never go wrong with Brees/Graham. Aaron Rodgers: $9,800 – Rodgers is coming off a bounce back game, and had a huge second half. However, a division game on the road is going to be tough, as the Lions are itching to rebound after their performance against the Panthers last week. Surprisingly, Rodgers has only averaged 14 fantasy points per game in his last three matchups with Detroit, and this Detriot defense is better than they were in those three games. We can get Brees for $700 less, and I see a lot more upside there. Matt Forte: $8,400 – Forte had a tough time finding running room against the 49ers last week. It won’t be easier this week, as he will see the Jets lined up across from him. Although the defense has only played two games, the Jets’ defense has allowed the fewest fantasy points to opposing running backs, and the defense has historically remained in the top 5 in that category. Spend the extra $400 and get Murray. Antonio Brown: $8,200 – Antonio Brown is one of the most consistent receivers, but I’m not touching him this week. While Big Ben looks his way often, the Panthers’ defense is tough. The Lions have a much better offense than the Steelers, and Carolina nearly shut them out last week, while keeping Calvin Johnson out of the end zone. There’s just better options this week than Brown. Rob Gronkowski: $7,700 – Gronk just isn’t back to form yet. He should progress as the season goes on, but the Patriots’ offense isn’t what it once was either. Eight catches for 72 yards through two games doesn’t scream “buy” this week, and P.S., Oakland has allowed only one touchdown to a tight end in its last eight games. If you want to go with a member of the Patriots’ receiving corps, go with Julian Edelman. There you have it for this week. When picking for and against the best players in the league and fantasy football for that matter, we’re playing with fire. These guys are all very good and can go off at any time. On the contrary, when a stud has a bad game, it’s even more painful. However, to win in salary cap football, you have to use an analytical approach to get the most value out of your lineup. Yea I am sold on Brown for the rest of the year.